Reversing course, NOAA Fisheries said it will allow anglers in the South Atlantic to catch red snapper for the first time in three years. Calling it an "emergency action," the fisheries service said it would create two mini-seasons over the next two weekends for recreational anglers in federally controlled waters off the coast of Florida, Georgia, South Carolina and North Carolina. Commercial fishermen may be allowed to catch red snapper until Dec. 31. "NOAA Fisheries has determined that the limited harvest in 2017 is not expected to result in overfishing and will not prevent the continued rebuilding of the red snapper population," the agency said in a statement released late Friday. Coming only four months after Commerce Secretary Wilbur Ross extended the red snapper season in the Gulf of Mexico, the decision revived a long-simmering debate about how much fishing should be permitted and the federal government's management of the popular species (Greenwire, Sept. 20). Critics said today allowing more fishing could threaten the long-term survival of the red snapper population, while supporters said it's more evidence the Trump administration wants to help both fishermen and the businesses that rely on them. Bob Zales, a charter boat captain from Panama City, Fla., and president of the National Association of Charterboat Operators, called the move "great news for folks in the South Atlantic." "Not only is this great news by itself, but opening the fishery before the end of the year will give the South Atlantic region a much-needed boost in social and economic benefits after the recent devastating storms that caused so much damage to the communities and people," Zales said today. Meredith Moore, director of the fish conservation program at Ocean Conservancy, has concerns about the move. She said NOAA Fisheries "is opening a season on the overfished South Atlantic red snapper even though scientists haven't determined what level of fishing is safe" for the stock. "This is yet another short-sighted, risky decision that jeopardizes the progress made in restoring our fisheries for both fish and fishermen," she said today. On Capitol Hill, the red snapper has become the poster child for those who want to overhaul the Magnuson-Stevens Fishery Conservation and Management Act, the nation's top fishing law, passed in 1976 (E&E Daily, Sept. 25). Opponents say the federal government has bungled its job in managing the species, with the law imposing too many hard quotas and restrictions on fishermen. Backers of the law say it has worked well to prevent overfishing of the red snapper and to protect other once-depleted species. 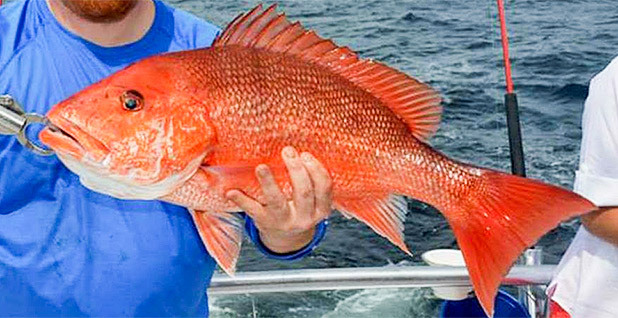 In a rare move in June, Ross ignored protests from scientists and environmentalists when he singlehandedly extended the season by 39 days for red snapper in five Gulf states: Alabama, Florida, Louisiana, Mississippi and Texas. Ross explained his decision to a Senate subcommittee in June, saying he understood fishermen "are frustrated" with shorter fishing seasons and he shared President Trump's "commitment to cutting unnecessary red tape and eliminating failed regulations." In its latest announcement, NOAA Fisheries said recreational fishermen will be allowed to catch snapper Friday through Sunday and Nov. 10-12. Under the agency's emergency rule, the agency said commercial fishermen would be allowed to harvest red snapper from Thursday until the end of the year, unless a projected catch limit is reached before then. The agency said it approved the change after receiving a request from the South Atlantic Fishery Management Council.